“What happens in Vegas stays in Vegas” is the catchphrase of the Las Vegas tourism commercials, which are staples to late night television. As a night-person, I have to admit that I am familiar with most of them. They are all similar; utilizing bright lights, beautiful people in designer clothes, and hypnotic dance music. This “Las Vegas image” is not only perpetuated by commercials, but also by television shows and movies. A few years ago, my family took a trip out West – staying at the homes of different family members and friends along the way. While in Las Vegas, we were generously hosted by my father’s cousin. I did enjoy the time we spent with him, but he tore this idealized image of Las Vegas apart. At first, he was hesitant to take us to the Strip, calling the place “boring” and “touristy.” Considering that we spent the night before dining at P.F. Changs in a mall outside of the city, I was ready to experience any part Las Vegas culture – no matter how touristy. Upon finding a parking space, he jumped out of the car and began marching along the sidewalk, pointing at casinos along the way. My parents and I tried to keep up after him – dodging tourists, sometimes unsuccessfully. I noticed that my family’s parade was attracting a good deal of attention: My mother and I tried to keep up, running and wincing in our high heels. But moreover, my cousin (who is a cop) had forgotten to leave his gun at home after work. I had gone to Las Vegas to see a spectacle, but found myself the spectacle instead. I do not know where I first learned about Dubai – but I realized that I had a very similar image of Dubai that I had of Las Vegas – wealth, some degree of lawlessness, with a transient population. So, when it came to choosing a book about the United Arab Emirates, I decided to choose a book focusing on the history of Dubai to hopefully broaden my understanding. 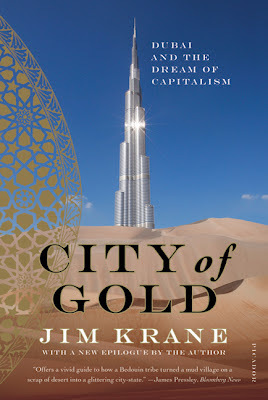 I chose Jim Krane’s “City of Gold: Dubai and the Dream of Capitalism,” an interesting book which explores the history, the success, and the future challenges of Dubai. First of all, I will give some basic facts of the United Arab Emirates. The United Arab Emirates (or the UAE) consists of seven separate kingdoms. Each of these individual kingdoms is run by a hereditary ruler called an emir. A relatively new country, it has experienced tremendous development since its creation in 1971. The two most well-known emirates, at least in the western world, are Abu Dhabi and Dubai. Abu Dhabi has gained much of its wealth through its plethora of oil reserves, discovered in the 1960s. Dubai was endowed with much less oil than its neighbor, and thus had to turn to other industries to achieve a higher level of wealth. One of the most interesting parts highlighted in this book is the relationship concept of citizenship, the barriers of citizenship for foreigners, and government stability. The government system of Dubai is very different from that which is familiar to me, and can be described as a “tribal autocracy. It’s autocratic because a single ruler, Sheikh Mohammad in Dubai’s case, holds unlimited power. It’s tribal because rule is based on tribe and family, with power handed down the generations” (page 135.) However, Dubai does benefit to some degree because it is autocratic. The Sheikh can make decisions that would take a great deal longer to implement in democratic nations like the United States. The author gives an example that when the Sheikh learned about new environmental standards; he required that all new buildings conform to them. Contractors in the middle of projects suddenly had to change and conform to these new rules. There is no democratic voice in Dubai. Nor is there much clamoring for a democratic voice. UAE citizenship is limited to ethnic Emiratis, who receive many handouts from the government. An average $55,000 yearly subsidy is given to each male citizen. Moreover, “Emiratis get free land, cheap electricity, and free water. Health care is free. Food and gasoline are subsidized. Education is free…” (page 267.) It is interesting to note that “UAE citizens make up about 15 percent of the country’s total population of around 6 million” (page 253.) In fact, citizenship is so restricted that multiple generations of foreign workers have been born on UAE soil, but citizenship is never offered to them. Citizenship is only for a select few. The rest of the people in Dubai are there only for the purpose of work or jobs – perhaps making it the ultimate city of capitalism.